Tadam helps you stay focused at work by reminding you to take regular breaks from work. Simple: Few buttons, few features, few options. Only what you need for productivity and nothing more. 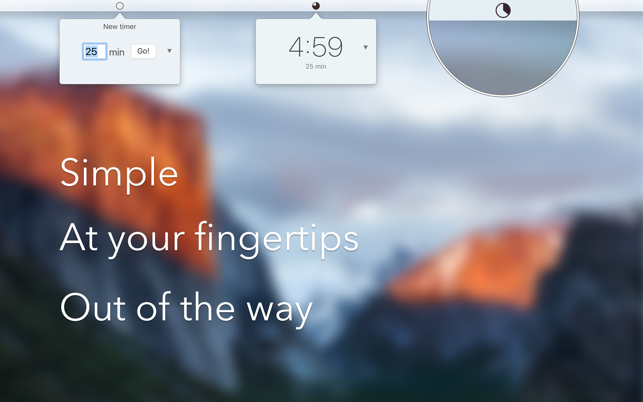 At your fingertips: Tadam lives in the menu bar, so it’s always just a click away. 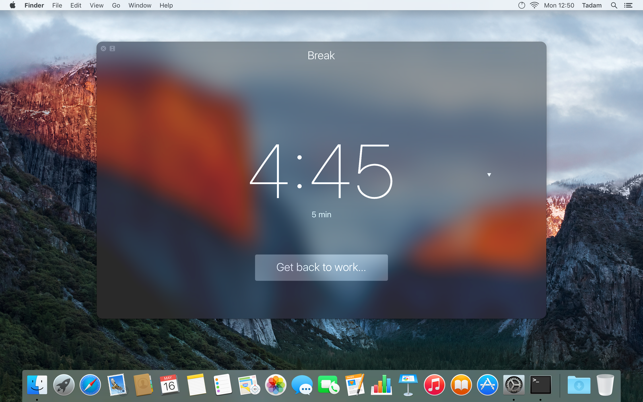 Out of the way: A quick glance gives you a sense of how much time you have left. When work time is almost up, you’ll get a gentle reminder to hurry up. Your brain is like a muscle — it gets tired with use. To stay focused, take regular breaks and let your mind recharge. Tadam helps you do that. When it’s time for a break, a big window pops up, reminding you to take a break. You can’t ignore it — you can either take a break or choose to work a little more. The window covers most of your screen, and if you move it, it will snap back after 30 seconds. It’s *designed* to be annoying enough that you’ll take the break like you know you should. Step away from your Mac. Have a walk, a glass of water. Breathe. Give your brain some rest. Tadam is for everyone. And if you’re a geek, it’s for you, too. You can set a hotkey to invoke Tadam from anywhere. You can control it entirely from your keyboard. You can set custom work and break durations any time you want. And you can shrink the break window if you want to spend it at your computer. - Cmd+M now toggles the miniature Break window. - I now speak German, French, Russian, Polish, and Ukrainian! I love this app because it is pretty, and solid, and does not require much attention from me to get out of it what I need: reminders to stay focused when I’m working and to relax when it’s time for a break. I especially appreciate that it is entirely usable via keyboard shortcuts: you can trigger the popover, start/stop and pause/resume the timer, start/end a break, and even adjust the time, all from the keyboard. It’s perfect! I'm so glad to find this timer. It's so smooth to use. So many thoughtful details. And it does everything I want without a bunch of clicking or menus. So great. Simplicity done right. Worth the price! I spent so much time looking for a productivity-minded timer app that I almost wanted to hire a developer to build it for me. As someone who uses computer a lot to work and play, I was looking for one that would blend seamlessly. One that would allow me to track how much time has passed but shown so subtle that it doesn’t distract me, yet allows me to use it easily. Some apps require you to open the whole window just to see how much time has passed or to set new time. It’s an awful experience when I’m in the zone and interrupts my flow - especially if I work the pomodoro way, setting ~25 min production periods and ~5 min pauses. Tadam is perfect because it goes in the background but still has its icon visible in the top bar which animates itself so beautifully that it’s a joy to track. 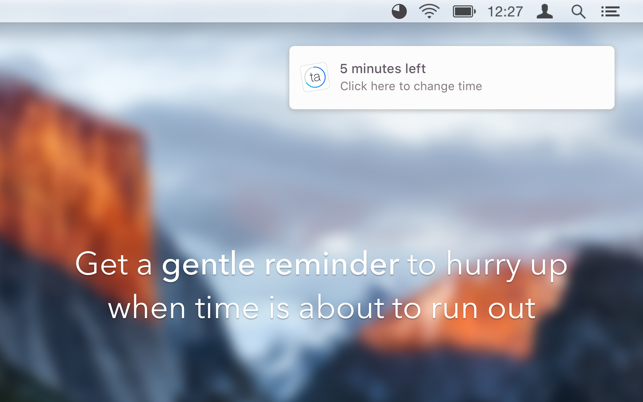 No windows, just a tiny popup with all the options you need for a simple time tracking. Highly recommended and supported because it’d be a really sad day for me if this app gets discontinued.